I have seen forest fires before but this left me shaken. Perhaps, because I was in the midst of the flames and acrid smoke this time. 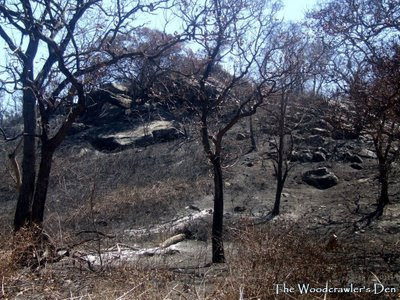 My favourite patch of real estate was a mass of charred vegetation. I was already primed for evidence of destruction by the newspaper reports that I had been seeing in the past week. When I drove through Mudumalai I could see the ferocity of the fire on either side of the road and on the southern side of the Moyar the forests were still burning. 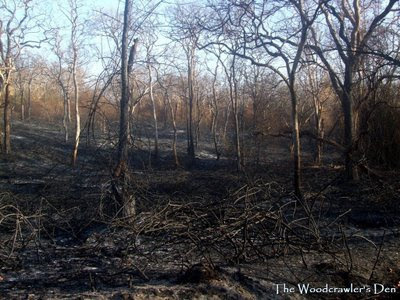 The heat was singularly oppressive and it seemed magnified by the lack of green that characterizes a teeming jungle. As I drove past the Kekkanhalla checkpost into Bandipur my heart sank at the sights on either sides of the road. Hillocks with all the vegetation wiped out greeted me. The floor of the forest was covered in a macabre shade of black and grey, with small patches still smoking from the embers beneath. Bandipur was burning, and I was there. Seeing the mayhem first hand and only able to watch helplessly.